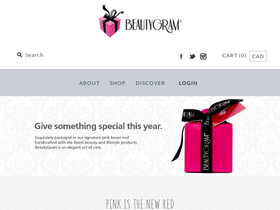 BeautyGram, online at beautygram.com, offers a beauty experience in a beautiful pink gift box. BeautyGram is a fantastic choice for beauty gifts to make any woman feel appreciated and pampered. BeautyGram offers luxurious beauty and lifestyle products delivered in a single box. BeautyGram boxes include soothing creams and lotions, candles, chocolates, soaps, teas, and much more. BeautyGrams offers a great way to give a personal, caring gift to your friends, family, or significant other. But before you shop, check out RetailSteal.com for the latest BeautyGram discounts, BeautyGram promo codes, and BeautyGram coupon codes. BeautyGram offers shipping promos that change often. Stop by RetailSteal.com for the latest BeautyGram shipping special offers. Sign up with BeautyGram.com and they'll send you a 10% off coupon code for your next purchase. BeautyGram offers beauty boxes from only $20. Click for a luxurious gift. Send a relaxing soak with the BeautyGram Mini Bath box for $20. Click to shop. Check out BeautyGram for their Signature Box, a 7-piece gift, for only $45. Give the gift of a personal spa box with the Bubble Toes BeautyGram box for $50. BeautyGram offers a variety of great gift boxes from $20. Click here to shop. BeautyGram offers the perfect bride's gift with the To Have and To Hold box for $90. Click to shop. Enjoy free shipping on any BeautyGram purchase with this coupon code! Save 15% on your BeautyGram purchase with this coupon code. Shop online and save today!